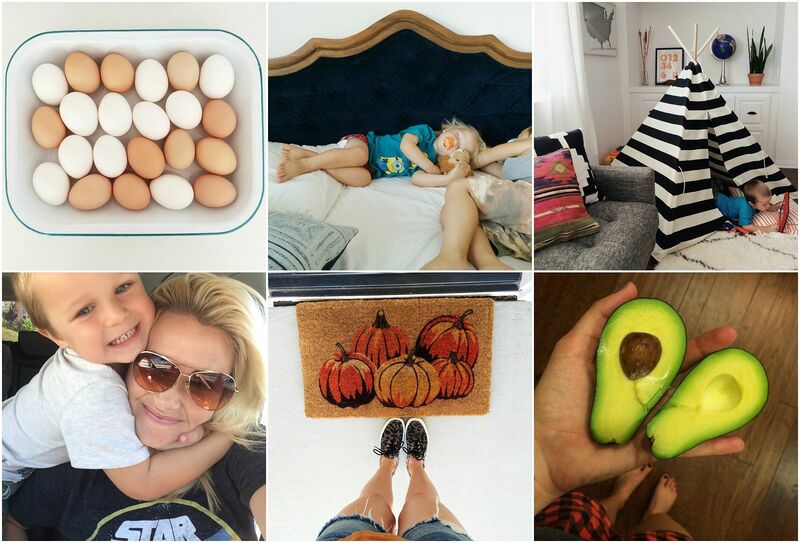 Here a few snippets of our week according to my Instagram. 1. Farm fresh eggs brought over by Grandpa. They are so rich and so yummy! 3. Max enjoying the life. Being 4 is awesome. Not a care in the world. 4. Waiting in the parking lot for Max's Pre-K class to start. He has been working on his bear hugging skills and here he is basically squeezing my brains out. 5. Adding a little fall-iday (ooooo I like that word) cheer to my front door step. 6. Slicing open a perfectly ripe and locally grown avocado. Not sure why this makes me so happy but it does. Hope you all have a wonderful weekend! Today I am off to a place of fun-ness with the boys to soak up this last bit of summer. Age 4 is just the best, isn't it?! Have a great weekend, Lindsay! hahaha that's hilarious. :) Kids are the best! And these pictures are all so beautiful.